"C-47" redirects here. For other uses, see C-47 (disambiguation). The Douglas C-47 Skytrain or Dakota (RAF designation) is a military transport aircraft developed from the civilian Douglas DC-3 airliner. It was used extensively by the Allies during World War II and remains in front line service with various military operators. The specialized C-53 Skytrooper troop transport started production in October 1941 at Douglas Aircraft's Santa Monica, California plant. 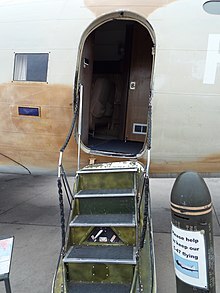 It lacked the cargo door, hoist attachment, and reinforced floor of the C-47. Only a total of 380 aircraft were produced in all because the C-47 was found to be more versatile. 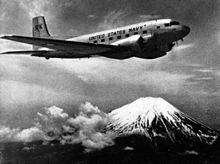 The C-47 was vital to the success of many Allied campaigns, in particular those at Guadalcanal and in the jungles of New Guinea and Burma, where the C-47 (and its naval version, the R4D) made it possible for Allied troops to counter the mobility of the light-travelling Japanese Army. 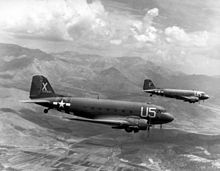 Additionally, C-47s were used to airlift supplies to the embattled American forces during the Battle of Bastogne. Possibly its most influential role in military aviation, however, was flying "The Hump" from India into China. 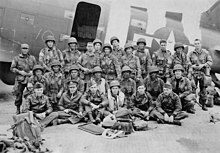 The expertise gained flying "The Hump" was later be used in the Berlin Airlift, in which the C-47 played a major role, until the aircraft were replaced by Douglas C-54 Skymasters. 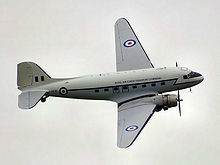 About 2,000 C-47s (received under lend-lease) in British and Commonwealth service took the name "Dakota", possibly inspired by the acronym "DACoTA" for Douglas Aircraft Company Transport Aircraft. 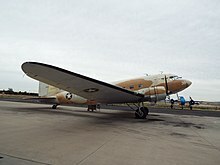 The C-47 also earned the informal nickname "gooney bird" in the European theatre of operations. Other sources attribute this name to the first aircraft, a USMC R2D—the military version of the DC-2—being the first aircraft to land on Midway Island, previously home to the long-winged albatross known as the gooney bird, which was native to Midway. Large numbers of DC-3s and surplus C-47s were in commercial use in the United States in the 1940s. In response to proposed changes to the Civil Air Regulations airworthiness requirements that would limit the continuing use of these aircraft, Douglas offered a late 1940s DC-3 conversion to improve takeoff and single-engine performance. This new model, the DC-3S or "Super DC-3", was 39 in (0.99 m) longer. It allowed 30 passengers to be carried, with increased speed to compete with newer airliners. The rearward shift in the center of gravity led to larger tail surfaces and new outer, swept-back wings. More powerful engines were installed along with shorter, jet ejection-type exhaust stacks. These were either 1,475 hp (1,100 kW) Wright R-1820 Cyclones or 1,450 hp (1,081 kW) Pratt & Whitney R-2000 Twin Wasps in larger engine nacelles. Minor changes included wheel well doors, a partially retractable tailwheel, flush rivets, and low drag antenna. These all contributed to an increased top speed of 250 mph (400 km/h; 220 kn). 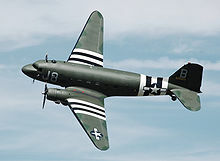 With greater than 75% of the original DC-3/C-47 configuration changed, the modified design was virtually a new aircraft. The first DC-3S made its maiden flight on 23 June 1949. 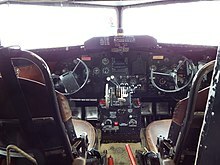 Initial military version of the DC-3 with four crew (Pilot, Co-Pilot, Navigator, and Radio Operator) and seats for 27 troops alongside the fuselage interior. "Aerial Ambulances" fitted for casualty evacuation could carry 18 stretcher cases and a medical crew of three. 965 built (including 12 for the United States Navy as R4D-1). 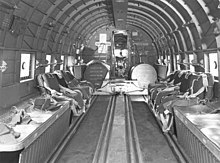 Troop transport version of the C-47 that lacked the reinforced cargo floor, large cargo door, and hoist attachment of the C-47 Skytrain. It was dedicated for the troop transport role and could carry 28 passengers in fixed metal seats arranged in rows in the former cargo space; 221 built. One testbed aircraft modified in March 1942 with full-span slotted flaps and hot-air leading edge de-icing. Converted to C-53 standard in 1949 and sold as surplus. Winterised and long-range Arctic version of the C-53 with extra fuel tanks in the fuselage and separate navigator's astrodome station for celestial navigation; eight built. C-53 with larger port-side access door; 17 built. C-53C with 24V DC electrical system and its 28 seats attached to the sides of the fuselage; 159 built. C-47B with 24-seat airline-type interior for staff transport use, 16 built. USN/USMC R4D-8 redesignated C-117D in 1962. USN/USMC R4D-8L redesignated LC-117D in 1962. USN/USMC R4D-8T redesignated TC-117D in 1962. USN R4D-8Z redesignated VC-117D in 1962. RAF designation for the C-47 and R4D-1. 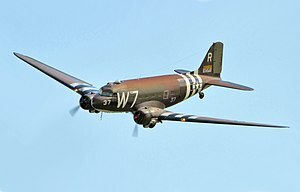 Large numbers of C-47s, C-117s and other variants survive, on display in museums or as monuments; operated as warbirds; or remaining in service. ^ Air International out of Miami International Airport was a military depot used by the air force to convert the DC-3s into military use. ^ C-47 Skytrain Military Transport Historical Snapshot Boeing. Retrieved: 29 June 2017. ^ Parker 2013, pp. 37, 39, 45-47. ^ Super DC-3 dc3history.org. Retrieved: 23 June 2010. ^ "DC-3s On Floats." YouTube, 8 November 2008. Note: first part has rare World War II film footage and narration by project manager for the XC-47C. ^ "1952 | 3204 | Flight Archive". Flightglobal.com. 1951-08-15. Retrieved 2018-06-27. ^ "Douglas DC-3 (CC-129) Dakota." Archived 2011-06-11 at the Wayback Machine DND - Canada's Air Force. Retrieved: 14 October 2009. ^ "Das Archiv der Deutschen Luftwaffe." (in German) LuftArchiv.de. Retrieved: 5 July 2010. ^ a b "Trade Registers". Armstrade.sipri.org. Retrieved 2013-06-20. "Our Tow Ships". National WWII Glider Pilots Association, Inc. 09 July 2014.